You don’t have to be a Golden State Warriors fan to know who Draymond Green is. Did You Know That NBA Player Draymond Green Compared NBA Referee Marat Kogut To Disgraced Game Fixer Tim Donaghy? A three-time NBA all-star playing his seventh season in the league, Green is almost impossible to miss considering the demonstrative nature of an on- and off-court personality that not coincidentally landed him in the middle of the most reported – and overanalyzed – story of the 2018-19 season: the verbal altercation between him and teammate Kevin Durant during a November 12 loss to the Los Angeles Clippers. The mainstream sports media’s overblown coverage of what was a brief, verbal spat between teammates was made all the more astonishing considering the fact that the NBA’s league office was in no way immediately involved in the controversy. “Golden State Warriors forward Draymond Green has been fined $35,000 for making statements on social media which impugned the integrity of NBA officiating; Warriors guard Stephen Curry has been fined $25,000 for his actions and public statements impugning the integrity of NBA officiating; and Warriors forward Kevin Durant has been fined $15,000 for public criticism of the officiating, it was announced Tuesday by Kiki VanDeWeghe, Executive Vice President, Basketball Operations. “The NBA’s investigation into this matter included the review of player conduct that took place through Sunday, March 31, and the ultimate findings were determined after verifying all available information. For Durant, who was fined $25,000 and Curry, who was docked $15,000, those incidents involved varying forms of criticism of NBA referee Marat Kogut – from Curry openly mocking Kogut during the game, to both voicing their displeasure after the game, to subsequent, somewhat subtle digs from both on social media. Unlike Durant and Curry, Green didn’t breathe a word to the media about Kogut nor lodge any overt, on-court protests of the referee before, during or after the game. The NBA has fined three Golden State Warriors: Draymond Green, $35,000 for social media comments on officiating; Stephen Curry, $25,000 for statements on officiating; and Kevin Durant, $15,000 for criticism of officiating. Yet Green was fined $35,000 – more than Durant and Curry each – solely because of something he did on social media. Something that not only reflected on Kogut but also the league itself. After the game in question, Green sent out from his official, verified Twitter account two Tweets. 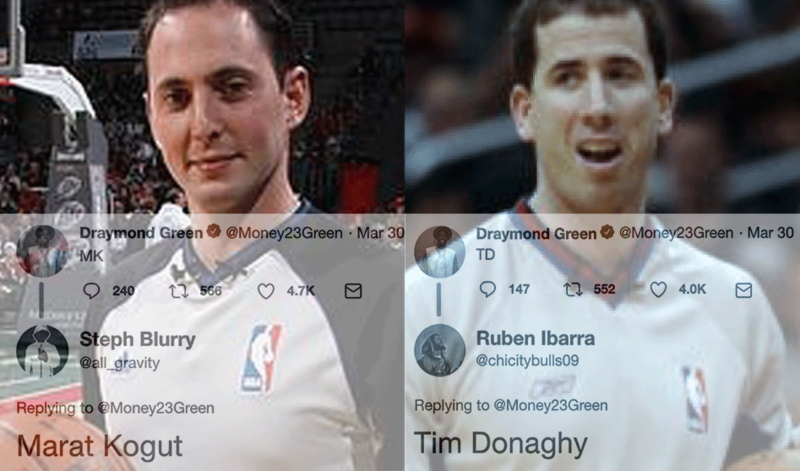 The first, “TD,” Tweet was a reference to notorious former NBA referee Tim Donaghy, who has admitted to betting on games while working as a league official. The second, “MK,” Tweet was a reference to Kogut and designed to link Kogut’s officiating to that of the disgraced Donaghy. The same mainstream sports media that spent weeks covering a single, seconds-long disagreement between Green and Durant that went completely undetected by most, if not all fans sitting a few feet away clearly chose to willfully ignore Green when it came to him doing something much more serious. That is, publicly accusing an NBA official of fixing a game in a Tweet that remains live on Green’s official Twitter account as we speak. By its refusal to even entertain the possibility that NBA games are being fixed, even when the league itself acknowledges the accusation by an active player about a specific game, the mainstream sports media is creating a bubble which, when it inevitably bursts, will damage the credibility of the nascent, legalized sports gambling industry so severely as to be unfixable. PreviousVIDEO: HOW DO WE KNOW BRET HART FAN ATTACK WASN’T FAKE?